MWAH! troupe's return appearance at Prophetstown High School | MWAH! Posted by Dan Eyrich in his online newspaper aroundptown.com ! A three-point shot will be a focus of the MWAH! 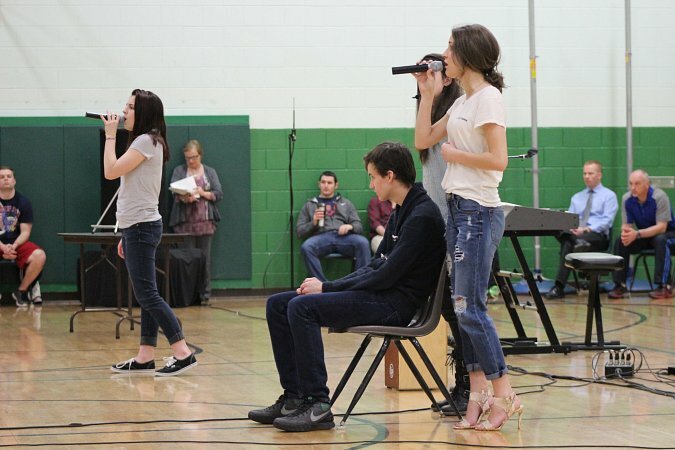 Performing Arts Troupe’s presentation at 8:30 a.m. on Monday, April 16, at Prophetstown High School, located at 310 West Riverside Drive in Prophetstown. Such buzzer-beating three-pointers by Donte Ingram and Marques Townsend won crucial games for #11 seeded Loyola University in the recent NCAA basketball tournament, advancing the team to the Final Four. Three points can also change and save lives – awareness of a problem, seeking help for it, and then getting whatever help is needed. Kevin Love of the Cleveland Cavaliers professional basketball team has learned this concept – both on and off the court. And the MWAH! troupe, using other true story examples, will show the value of this concept in dealing with such issues as self harm, such as suicide, and harm to others, such as recent school shootings. Featured during the 90-minute presentation as positive examples will be the Change Ambassadors, a group of concerned and creative Prophetstown High School students, as well as other students from the school who will be recognized as heroes. Ending the presentation will be an energized dance duet and the song ‘This Is Me,’ which will focus on the acceptance of others, regardless of how they look or speak and whatever their ethnic, geographical, or economic background. The essence of the MWAH! ensemble (acronym for Messages Which Are Hopeful!) is real life stories, combined with contemporary music, lots of audience interaction, and a range of emotions. Its mission is to change lives and save lives. A common thread is choices and the importance of making the right ones. About an hour following the presentation there will be a debriefing-type discussion session involving students and school support staff, focusing on issues which had just been presented. The high school support staff will be available for further follow-up. The presentation is being sponsored by the Farmers National Bank of Prophetstown and the Prophetstown Banking Company. Bank President, Don Vogel, will speak briefly at the beginning of the Monday presentation. Further information about the MWAH! troupe is available on its website at www.mwah.net ! or by phone at 630-881-6730.